The first complaint about any development is generally its size. In the case of this development, the plan is for this building to match the four story building next door. As it is the exact same size as a pre-existing building, the size complaint does not hold much water. To go further, of the 7,083 housing units in the neighborhood, 20% of them, or a little more than 1,400 are in apartment buildings with more than 20 units. That means many residents are already in buildings just as dense and just as large, if not larger than this one. This is a more challenging argument to take on with pure numbers. As a popular commercial strip, fronting Park Ave. with green space is not architecturally appropriate (any more so than developments fronting Park Ave. with parking lots). Ignoring the fact that this development is less than a half mile from the 109 Acre Cobbs Hill Park, asking the developer to incorporate some kind of green space, however underutilized it would be, in lieu of some parking, is not terrible. A better idea might be to request funding of improvements to other, existing, Park Ave. green space. While I personally am unsure why this is a concern of the community rather than one of the developers, I have to assume that this is code for “dropping rents and opening the floodgates to a bunch of drunken college renters that we don’t want on Park Ave.” I have to say that we will have to attack this in a somewhat roundabout way. Why you ask? Well, not a single housing unit has been built since 2000 in the Park Ave. neighborhood. That makes comps somewhat difficult. Even so, over 21% of the 4,753 occupied rentals in the neighborhood already rent for more than $1,000 a month. On top of that, average rents for similar units in Erie Harbor and Corn Hill Landing are well over $1,500 a month in locations that are not as desirable as Park Ave. Suffice to say, these apartments will rent for just about whatever the developers ask. At the moment that asking price is said to be $1280-$2200 for one and two bedroom units. Let’s get this out of the way at the forefront of this section. Park Ave. is the most walkable neighborhood in the city. Now then, parking! Car ownership in Park Ave is, not surprisingly, higher than Rochester on average (car ownership trends well with income and Park Ave. has more income). Let’s take a look at the 6,240 households (occupied housing units) in the neighborhood. Nearly 11% of these households have no car at all. Another 53% have only one car. Finally, 29% have 2 cars (the rest have 3 or more, and let us assume they will self select out of an apartment complex for want of a driveway and garage). That means if the people renting these units were perfectly average compared to Park Ave. as it is today, they would bring with them 57 new cars. Considering there will already be interior space for 51 cars, the other 6 should fit easily in the 48 space overflow that the developer is proposing. Let us go further, though, and imagine that the renters in this building look not like everyone on Park Ave., but instead like the other renters on Park Ave. Here we find that there are would be even less cars, at 55. And again, this ignores the self selection that comes with renting in an apartment building. Now let’s look at traffic demands. Some 90.3% of the 7,437 commuters in the neighborhood either drive alone or take a car pool when commuting to work. That means we can expect, with an average occupancy of 1.45 people per unit (let’s imagine they’re all commuters and no children or retirees), 70 new commuters from this apartment building. 63 of them will be driving to and from work each day. You’d never know it, but not everyone leaves their home at once to go to work. The busiest period in the neighborhood is from 7:30-8:00am when 19.3% of commuters leave for work. Based on this, at the height of “morning rush hour” this development will produce, as a maximum, approximately 12 additional cars on Park Ave., or one every two and a half minutes for about a half hour each morning. This is not the straw that will break the camel’s back. This is a straw man argument. This lot was downzoned a number of years ago to R-1, specifically to prevent anything from ever being built here. To say no to new neighbors, or businesses, or really anything other than the delightful parking lot and empty grass square that is here. There is no better place in the city than here for a building, and the zoning change is inconsequential to that fact. Zoning is not some God-given property of a piece of land. It’s just a marker, and one that is increasingly less useful. This is the final, and most controversial piece of all of this. The intial plans are shown here and you can judge for yourself how well the development matched with the neighborhood. For the most part, I believe they do. Even so, this is the kind of thing that a developer is most open to negotiating. Having a smaller building costs a developer real money, in the form of foregone rents. In the case of the street facing façade, most renters don’t notice this at all, but designing something that is compatible with the neighborhood is not as challenging as one might assume. There are a number of talented architects in Rochester, from Plan, to CJS who would be up to the task of a treatment for this building. Again, this is something to work on, not say no to. As for the number of units, or the appeal, or any of the other factors, the data above speaks to exactly how compatible those features already are. Is this development perfect from the start? No. And no development ever is. As excellent as I think this apartment building would be, I believe that adding a curb cut to Park Ave. and omitting new commercial frontage is a mistake. Could these kinds of changes be implemented given a functional dialog with the developer? Almost assuredly. If we are ever going to grow Rochester again, we need to start somewhere, and I can think of no better place than here. The people who move to an apartment building such as this are the kinds of new neighbors who gush to their friends, build a stronger tax base, and will care about their neighborhood going forward. This is a golden opportunity to choose neighbors instead of having them foisted on us. Why fight this here and now? Let us know what you think in the comments below. And whether you’re in favor of, or against this project, send your thoughts to Peter Siegrist by calling 585-428-7238 or emailing him at Peter.siegrist@cityofrochester.gov. This entry was posted on Wednesday, March 6th, 2013 at 8:00 am	and is filed under Opinion, Reader Submitted Stories, Rochester News, Urban Development. You can follow any responses to this entry through the RSS 2.0 feed. You can skip to the end and leave a response. Pinging is currently not allowed. Thanks for the well reasoned article. I always thought this lot was neither here nor there. Would be good to see something done with it. This area is probably one of the worst places for parking IMO, but it still sounds like a good plan. I had no idea rents were so high, though. The low end of that range is about what we’re paying for a ~2000 sq. ft. home in Highland Park (mortgage + taxes + insurance). Crazy. Where did you find the information on the # of cars per household? I think in this case not having commercial space is ok because for the most part Park Ave is a residential neighborhood. It will force those living in the new building and those visiting to take a short walk down the street, further concentrating people to the stores down the street. Is Park Ave “the most walkable neighborhood in the city?” What’s the source for this data? A quick glance at the heat map at http://www.walkscore.com/NY/Rochester shows several neighborhoods with more access to a wider array of amenities. Hi all! Thank you for the excellent comments. 1.) As to the high rents. There really are no comps for this. As I said, rents go from $1500-$1800 a month for apartments in Erie Harbor. They are nice, but not so different from any old standard new build. This building has location going for it, but will also need some premium amenities to garner these prices. It’s nothing some granite counter tops, stainless steel appliances, and radiant floors in walk-in-wet-room-bathrooms won’t take care of. These are not particularly costly features to construct, either. 2.) Cars per HH also comes from ACS data. The summary “Selected Housing Characteristics” table contains this data. If you were to look at Rochester as a whole, 25.7% of occupied housing units have no vehicles available. This is purely economic, since the city is set up to be amazingly car friendly (probably more than it ought to be considering a quarter of all households don’t have one, OOPS!). 3.) So according to walk score, Park ave is the 4th highest ranked. Real quickly, though, if we are to look at the top 3, in order, they are: CBD (inner loop), Pearl-Meigs-Monroe, and Swillburg. All three of these are within 6 points of Park Ave. Additionally, while the CBD might have more amenities for lunch on a given weekday afternoon, it is not a 24/7 neighborhood. Pearl-Meigs-Monroe is excellent, but also overlaps with this article’s definition of Park Ave. Its somewhat higher walk score comes, in part, from Park Ave itself. Finally, Swillburg has less than 1/3rd the number of residents of Park Ave. It’s ok, but it’s walkscore comes solely from being sandwiched between the South Ave and Monroe Corridors, thus giving it great access to these retail options while having very little itself. This isn’t to pooh pooh any of these three neighborhoods, but, and you’d be right if you think this is subjective, believe that Park Ave. bests them in all around walkability despite the nominally lower walk score. walkscore.com is not that legit. It looks like they are missing a lot of factors in their calculations. @Jimmy — it’d be great to hear what factors you think are missing from Walk Score’s calculations. @Tony, are you from Walkscore.com? Alright! You all heard the man. Walkscore feedback please!! @Tony – I generally like walk score, but I think one of the biggest issues for an argument like this is slicing the walkscore to neighborhood definitions. Geography is a continuum. Is a person on one side of Alexander Street really worse off than someone on the other? Maybe if Alexander is a 6 lane highway, yes. As it stands, probably not. For reference (since it hasn’t come up here yet, my bad!) the walkscore of this specific address (759 Park Ave.) is 91, or higher than any one neighborhood in Rochester. @Matthew — thx. It seems to me that if discussion compares specific points, then it should use the Walk Score of specific addresses (which would likely be near identical for places across the street from each other). Neighborhood scores average some area (one has to draw a line somewhere), and naturally some individual points will be further from that average than others… This doesn’t seem like a technical problem, but in construction of argument that compares two very different things (area to a point). @Tony – I agree! It’s really not, although I guess the feature that would be nice is to set an arbitrary area to get a walk score from. For example, the set of census tracts I analyze for the article. Maybe this is possible and I just don’t know how? It’s possible to get custom areas / sets-of-points scored (in greater level of detail than available on the website) through Walk Score’s Research Services — http://www.walkscore.com/professional/research.php but it’s a “Professional” level feature. @Tony, out of curiosity, have you ever considered applying walkscores to routes (point A to point B)… either with a directional/map feature built right into Walkscore, or by overlaying Walkscore onto Google Maps, or some other existing mapping tool? Say for instance I want to compare to alternate routes to go for a stroll, or get to the office? Both may be in the same neighborhood(s) but there’s often a clear winner. Also, in a similar post last week someone mentioned “crime” as factor that impacts walkability. I’m not saying it should or shouldn’t be, but why aren’t crime rates factored into Walkscore? @Tony – Thank you for the information. I’ll look into using it in the future. I am sometimes quite professional. As for more about walkscore (since we’re now having a lovely walkscore discussion!) the base algorithm seems to still be based on an un-path-aware system. This gives Roosevelt Island in Manhattan where I used to live a score of 82. The new path-aware beta algorithm gives it a 23 (it’s on an island with few amenities!). I know this sort of issue is “rare” but it happens with incomplete barriers as well. I just tried it with 79 Clinton Ave in Rochester, and the Beta walkscore is higher than the non-beta, but large portions of the walk score come from the far side of the inner-loop, which is a bear to cross. I think related to this, the walkscore does not include amenities like streetlights and sidewalks, not the crime rate to my knowledge. All of these have real consequences on walkability. THAT SAID! I do really like walkscore, and I think it’s super useful for the application here (which is to say that constructing an apartment building here is an excellent idea and will not attract as many cars as one might believe). @RochesterSubway — we don’t currently do walk route suggestions, but it’s an interesting area to think about. Every once in a while someone says “but Walk Score doesn’t consider how pretty this walk is”, and such kind of subjective criteria is incredibly difficult to evaluate algorithmically. Still, something to keep in mind. Similarly, “crime” is a difficult to get right. Just about every “crime map” app in existence right now basically looks identical to a population density map https://xkcd.com/1138/ (there’s more crime in areas where more people live). If we were to count this metric, we’d want it to actually be meaningful, and that will take time. @Matthew — yup, there are edge cases for certain layouts. Street Smart solves some of those more accurately (but as you’ve pointed out, that’s a Beta feature). In addition to crime discussed above, “streetlights and sidewalks” would also be good to consider, but it likely comes down to availability of such data. We might be able to get some cities to tell us where their streetlights are, but there will likely be a lot of spots where such data is simply not available. Anyone know anything about the status of this? @ELF – Dead as a doornail at the moment. The neighborhood fought that tooth and nail as well until the developer ran out of money/the market crashed. The lot was put on the market a few years back for about $600k, but anyone who wants to build anything marginally useful here is going to have an up hill battle on their hands. I do not envy them. Really? What was wrong with it? Anything has to be better than a vast empty lot in an affluent neighborhood. In their own words, they wanted a less dense plan. Apparently 8 units/acre is too dense for a neighborhood that, by my rough calculation (approximately 530 acres and 7000 housing units) is already 13 units/acre. Go figure. Im really tiring of this NIMBY attitude in this part of the city. From your account they killed this project and it looks like those around East and University are working to kill that development. Both seem much better than most city developments and I haven’t heard of either getting city subsidies. What happened to the townhouses on Barrington? Was that the market or neighbors that killed it? @Jim – Exactly as I just described it. The residents of Park Ave. managed to fight it long enough that the developer ran out of money and nothing was built. More interestingly is that they blame the developer for not being able to follow through and complete the project despite their own intransigence. And again, over a project that is about half as dense as the current built environment. As far as I’m concerned, those townhouses, while nice, would have been a big step backwards. That lot could easily support 12-18 units. They’d be fine as a townhouse styled building, ala the one 2 blocks away on the corner of Park and Vick Park B. and don’t need to be some kind of 4 story glass modernist piece or anything. You could actually make good money if you were able to build 18 market rent units on this spot, although be sure to save up a ton of money in advance for legal fees. As a Park Avenue resident, I’d be happy to see this space put to better use. I’m not crazy about the aesthetics of the design, but anything would look good next to that oddly unadorned yellow building, which I guess is the Talmudic Institute. Matthew, I’ve been enjoying reading this series, and would love for you to weigh in on the proposal for the apartment building next to the Eastman House. So because Rochester has been drunkenly stumbling around aimlessly for the past 2+ decades we should now halt the presses and not build anything? Rochester hasn’t built a subway in 80 years, so we really shouldn’t build a fixed guide way transit system now? I mean, how is that even an argument? Really? Too much additional population? 102 units with an expected occupancy of 1.45? There’s no way a city of 210k people could handle 148 possibly new (if these people come from outside the city in the first place) residents? Even at the neighborhood level it’d be a mere 2% increase in population. Based on their research of nothing of note being built in the last 25 years, an amortized growth rate of 6 residents per year is pretty weak. Is this supposed to be a desirable neighborhood? Going one further, I’m REALLY mesmerized by the Eastman House’s opposition to the project. In NYC, museums LOVE when new residential buildings go in near them, especially expensive ones. These are buildings that will be filled to the brim with wealthy patrons-of-the-arts. Morgan isn’t proposing to build a tent city next to the Eastman House. Anyway! I’m really sorry in advance if I reuse some of the exact stuff I just wrote in this comment in next week’s column. Consider it a sneak peek? Oh yeah, and the walk score of 933 University is 83. @Tony – After reading some of the earlier comments I checked out walkscore.com, I found that it generally reflected what I have observed. I only have one question, why is there large green area over the railroad yard located between Atlantic Ave and Main Street, having worked in this area for years, it was not very walk-able. 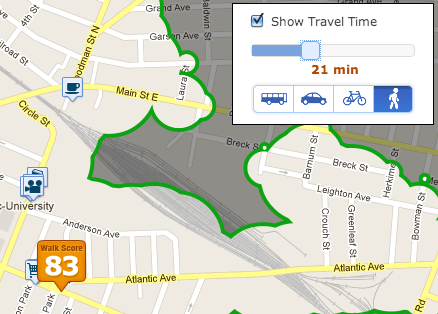 @Michael — presumably you are talking about area around http://www.walkscore.com/score/188-anderson-ave-rochester-ny-14607 which scores an 85. The location does have a number of places nearby, but the fast version of the score fails to account that the tracks are not easy to cross. Matthew has already been talking about the path-aware scoring above, which would count that area as a 72 instead — http://www.walkscore.com/report/188-anderson-ave-rochester-ny-14607 — a shade of yellow. @Matthew – I attended the Eastman House’s preliminary meeting on the proposed apartments. They did have some images showing how the development would negatively affect their viewscape, but their biggest argument overall was that they were in dire need of more space and wanted that property to expand onto. Except they also admitted they were “asleep at the wheel” and let the opportunity to acquire the property slip through their fingers. I was also bothered by a comment made by a NOTA resident in attendance, in which he expressed concern about more renters in what he saw as a neighborhood of homeowners. He was concerned that renters don’t care about the neighborhoods they live in. He was immediately corrected by other attendees who pointed out that NOTA is a mix of both renters and homeowners, but his attitude was disturbingly familiar to what we’ve seen from Pittsford residents regarding the proposed apartment complex on Monroe Avenue. I wonder how many homeowners in the city have similar sentiments. @Tony – Yes, That is the area. Another factor for the path aware scoring might be land use / zoning as industrial (vacant and occupied) does make an area feel less walk able. Though I am not sure how easy that would be to incorporate. I think many people are shocked to discover how many renters live among them. It seems that frequently, renters are considered an under class. This is deeply unfortunate. I also think part of it comes from the idea that renting is only for people with a lower income, since clearly if you had more money you’d buy a house. I think it’s just that product worth renting in Rochester hasn’t generally been built. There are huge advantages to renting, including the lack of hassle involved. If there is no rental stock of the appropriate quality, though, the only options become buying a house in the city (where the stock is also lacking in many ways) or buying a house in the suburbs. It’s hard to buy a new house in the city, because as we see here, neighborhoods where someone might want a new house get to stop new houses from happening all while we deeply subsidize the construction of new houses, then the purchase of new houses in neighborhoods that are unloved. That’s not to say we should not encourage construction in less served neighborhoods at all, but the subsidy is all the higher because it implicitly includes the cost of preventing people from moving into desirable neighborhoods as well. @Michael — that’s not always the case though. For example in Seattle there’s a 97 point location on top of the railroad yard (although not as large). http://www.walkscore.com/score/4th-ave-s-and-s-jackson-st-seattle-wa-98104 But given the fact that rails are mostly below ground level and the number of different amenities in the area, that score is well deserved (routed Street Smart is actually 99). Note the location! The NIMBY attitude kills a lot of potentially great development in this city. Like the people who move next to an airport and then complain about the noise, don’t move to a vibrant city neighborhood and expect it to change when that vibrance annoys you. That is the funniest thing I’ve read in weeks. LOVE IT. As for the NIMBY attitude, it is a bunch of people trying to do what they think is best, but without any sense of what levers to pull to get it. More density does not equal more crime (per capita), and eyes on the street (Thanks Jane!) really are what we need in places. Having some more people who work from home and are in a neighborhood to sustain businesses doing the week when most of their money is made on weekend would be a huge boon. As would the improvements that could come to Rochester from increased tax receipts. Another solution to pressuring development in Rochester would be taxing land at it’s potential rather than built use. This is an idea growing in popularity, but it would have a hard time gaining traction based on the status quo. I just don’t get the reasoning, as you pointed out the added population is negligible and its on open land for the most part. As someone else pointed out the 40/8 club house isn’t really a significant building. It’ll add to the tax rolls which is good, it’ll add people to the neighborhood which is good (hopefully attract new business). Its smart growth. The thing that bothers me is it seems these neighborhoods are against anything happening. The parking issue on University is laughable, anyone that has been down there knows street parking is plentiful 90% of the time. I guess if we won’t let anyone build in those neighborhoods we desperately need to fill in the inner loop. That’ll free up some ok to develop land in an area people will want to build. You are attributing reasoning to the people fighting these projects that goes beyond, “new people in the neighborhood will surely be bad.” Whether it’s because of preconceived notions about renters, or just that it’d be an inconvenience if they did not have a parking space available within 5 ft of wherever they want one at all times. Incidentally, the new land thing will only work if almost all of it gets developed at once, or a really good master plan is put in place beforehand. Otherwise, as soon as the first few new residents move into new buildings, they will fight the construction of further new buildings. Yay!! I love Park Ave! Holla! I and my fiancee moved into the park ave neighborhood back in august (renting in a large apartment building) and love it. That said, I couldn’t believe how hard people tried to fight the new Wegmans construction. I agree that residents here are very resistant to any new construction. Frankly, I think people just like things how they are and do not see the benefit in adding residences, especially with how noisy Park Ave can be. I would guess many residents simply don’t want the businesses in the neighborhood to have more business, even if it would mean more income for the area. People don’t wait for tables at restaurants or deal with heavier crowds in stores (again, I disagree with this stance, but it is there). I agree that the current lot is very unattractive and would like to see a new construction (and may even consider moving into a new building). However, if it is a rental, I would like to see restrictions placed on it, mainly age, preferably no residents under 25 or so. Rent also needs to be high enough to maintain income levels in the neighborhood. I love park ave and would love to see it continue to thrive. Hopefully something good can come of that lot. Sure, parking and traffic will be “slightly worse” – but as a local homeowner (1 block away) I will accept that to help the neighborhood expand and grow. Rochester is ALWAYS complaining about lack of growth. This is what growth looks like. However – Omitting first floor retail along Park Ave is inexcusable. MANY studies on Urban Development show how successful mixed-use is. Why can’t we have retail on the first floor to serve the new population and help Park Ave become more of a destination? So about retail on the first floor of this building. I think the main reason it is not there, but cannot confirm this, is that it would require further zoning allowances opening up that many more fronts on which this development can be opposed. I mean, if the neighborhood is already scared of a bunch of drunk college kids moving in, the opportunity to open another bar to cater to them must be the stuff of nightmares. As for whether it SHOULD be there, I’m actually really on the fence. Should things on Park Ave have retail frontage? Probably. But where does that end? It’s clear that the retail feel does not exist east of Culver. But I’d argue that it really doesn’t need to extend past the plaza at the corner or Park and Somerton. An alternate idea that I just spent a little time thinking about might be the addition of retail space fronting what is currently the parking lot for this plaza. With some reprogramming to the lot and the two retail spaces facing it, this could actually be a really happening mid-block spot. A little enclave off the Avenue. I think it would require too much coordination in the present state, but parts of the garage would be easily convertible to this rather novel purpose in the future. Rezoning to R-3, the high density residential district, allows 1st floor commercial uses in buildings of 20 units or more with a special permit. R-3 zoning is what all the streets between Park and East Avenues, immediately across the street from this site, are already zoned. Retail would be fine here, or not. A better opportunity for more and better retail, in my opinion, is the redevelopment of the shabby looking plaza with 7-11 in it, west of Berkeley Street. Would love to see that demo’d and replaced with a mixed use, multi-story building. Oh, but the neighborhood would probably fight that too. This a dense urban neighborhood. We couldn’t possibly accommodate any more people living here. Better to pave over some field or forest in Victor than develop in a walkable, transit-served city neighborhood. You could build something massive in that spot. That would terrify people. I’d love to see it redeveloped. Even re-siting the commercial and having only two floors of apartments above would be a huge upgrade. Needless to say, this is the kind of spot something tall could go set well back from the street and add significantly to the neighborhood. I doubt it will ever happen. Where would everyone park? We’re reviving the discussion about possible retail first floor in the the proposed development at 759 Park. @Renee, good article. I just left a comment. Basically I think mixed-use all the way. Whether it’s retail or a little office space is up to the developer to work out with the neighborhood. But we should want to have people using the building and those parking spaces around the clock. Eliminate dead spaces. That’s why a mix of uses is important; for the health of the neighborhood. @Renee – Look at this! We all posted comments on rocville instead of here. And unlike Mike, I’m totally not spoiling mine. Thanks for taking the time to comment in both places, Mike and Matthew. I am an advocate for things that make neighborhoods more vibrant, but I am not a zoning/urban planning expert which is why I pulled you in. @Renee – You’re too kind. I only play an expert on TV. I think if I were held to strict zoning, I’d be snowed under pretty quickly. Rochester does have its zoning charms, though. I also want to make everyone here aware of a forum coming up on this very issue… Development in Preservation Districts. Good article. I believe when reading through this the authors true opinion of the subject whether intended or not, shines through.I disagree allowing this property to be built. Full disclosure : I am pro growth Rochester 100% and own multiple properties in this neighborhood. I live/own about 8 houses away from this lot and I think it could be developed in a different way to best suite Rochester’s pro growth agenda. What is the vacancy rate among all units in this neighborhood ? Has that been examined ? Existing units could be upgraded or expanded to attract more residents and this neighborhood should growth from the edges to spill over into other neighborhoods rather from the busiest four blocks to create further traffic/density issues.Rochester lacks connectivity from one neighborhood to the next and has stretched itself out rather than focus on growing one area. I think this project should be moved to a Monroe/University IF the occupancy rates deem more housing is needed. This space should be converted to a dog park/concert area or something unique that draws residents in to gather as a community. Rochester’s busiest neighborhood doesn’t need new housing it needs new ideas. Hi Dan, I’m not positive I understand the gist of your comment, but from what I can tell, it boils down to this. ‘I’m very pro-growth Rochester, just in neighborhoods that aren’t mine.’ If that’s NOT what you’re saying, please feel free to correct me. That happens to exactly define the term NIMBY. The reason it is Rochester’s busiest neighborhood is exactly because it’s desirable. If there were a great deal of vacancies, it would not be so lively. What, exactly, is the benefit to adding more amenities to the neighborhood while not adding any new housing to take advantage of them? To line the pockets of current home owners by further increasing property values in an already desirable place? To shut out new neighbors of more modest means? To proactively favor one of the richest neighborhoods in the city at the ongoing expense of poorer ones? I’m just not sure I follow. Building in the Park Ave. neighborhood benefits Park Ave., the people who are now able to move to there, and the rest of the city as beneficiaries of a growing tax base. I guess it also physically pains the current residents. People who might not make as huge of a profit on their home, or might ultimately wait an extra 30 seconds for their latte at Boulder, because the lines got a little longer. That’s right, pound sand rest-of-Rochester.